Alive and Young: Life, It's Like Closet Space. 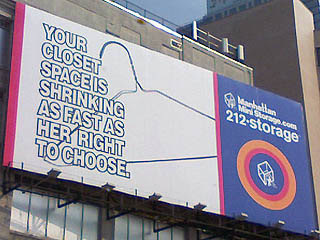 Over in New York, Manhattan Mini Storage thinks it necessary to liken closet space with human life. I'm sure they will get lots of business with that sign. Just after people drive by and say "gross". Maybe next time they can have a photo of an aborted fetus with the caption "Your closet space is being aborted as fast as this lump or cells" or maybe a picture of a brain that reads "Your closet space is shrinking as fast as our brains (act now and we'll throw out our common sense, decency, and moral integrity)". If you want to call and complain the number is 1-800-STORAGE (786-7243). If you want to email: advisor@manhattanministorage.com. UJA-Federation is a network of over 100 worldwide agencies that provide life-saving social services, education, and cultural experiences for millions of people in need, particularly Jewish people, in New York, Israel, and around the world. But did not find any "partnership" with Catholic groups.